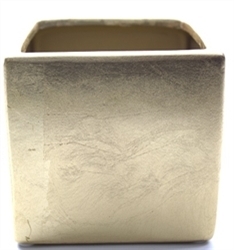 Browse our large selection of cube vases in many different colors and sizes. Always bringing you the best possible pricing. Cube vases are among the best selling vases on our website. Thick walls, and heavy bases, with subtle curves make these modern style cube vases are perfect for short seasonal flowers. They are often combined with different sizes and shapes, and go well with many other vases. For the clear cube vases they can be filled with gems or stones which makes a great accent to any event, or tie ribbon around it for a neat, unique look. These vases are also very commonly used as candle holders. For the colored cube vases they are solid colors and not see through. The only see through glass vase is "clear".